These models will be stripped and repainted. They are not painted very well and aren't really needed in my Nurgle army anymore. A significant number are Chaos Space Marines armed with Heavy Weapons so are not legal in an all Nurgle army anymore. I always intended to paint some non-Nurgle models but I could never finish my Nurgle army. After my next Grand Tournament appearance it will be considered done. 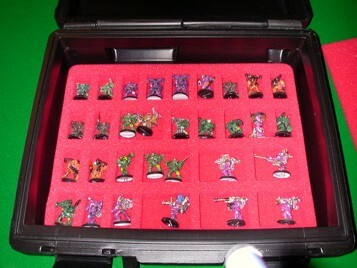 I then plan to paint some Chaos Undivided troops as well as my Ork and Goblin fantasy army.